This route is the final leg from Lobuje to Kala Pattar. 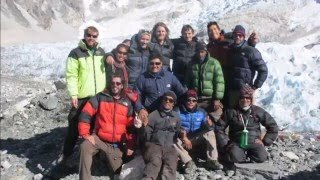 From Lobuje, the trail climbs steadily, but not steeply up to Kala Pattar where you'll reach your destination at the Everest Base Camp which is the highest base camp in Nepal. From here, there are incredible views of the surrounding peaks! Coming down on the Everest Base Camp Trail.